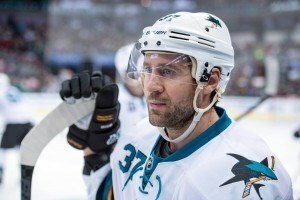 The San Jose Sharks have placed veteran forward Adam Burish on waivers with the intention of buying him out. Burish has one year remaining on a four-year contract worth $1.85 million per year. Once he clears waivers, the buyout will put $616,667 against the cap for the Sharks in each of the next two seasons, according to Hockey’s Cap. The Sharks aren’t particularly cap-strapped, with $16,041,670 in cap space at the moment, according to General Fanager. But Burish clearly wasn’t going to be in their lineup next season and they’ll save themselves $1,233,333 against the cap. Should the team make some big moves this offseason, they’ll have a little extra wiggle room. Burish found his way into just 20 games in 2014-15, scoring one goal and two assists with 33 penalty minutes. He was sent to play for AHL Worcester and then in January the Sharks loaned Burish to the Chicago Wolves in an exchange that sent former Shark John McCarthy to AHL Worcester. In addition to the Burish news, Sharks GM doug Wilson confirmed that the team will not be bringing back enforcer John Scott (but he scored a career-high three goals last year!) or defenseman Scott Hannan.